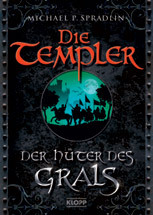 SPOILER ALERT: This book is a sequel and should be read after Keeper of the Grail. Washed up on a foreign shore, Tristan is lucky to be alive. As before, it seems to be a miracle—the Holy Grail the young Templar squire is safe-guarding has saved his life yet again. But now he is lost in a strange land, and he doesn’t know if his friends still survive. Tristan’s knack for getting into trouble is alive and well though, and he quickly finds himself drawn into a conflict between a heretical band of Cathars and the oppressive King of France. With his duty to the Grail pulling him back toward Britain, Tristan finds himself falling for the beautiful leader of the Cathars. 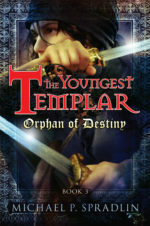 And when he chooses to help her in her people’s hour of need, Tristan risks not only himself but his friends and the Grail itself on a quest that may prove a disaster. Check out the Preview Video for The Youngest Templar: Trail of Fate below. 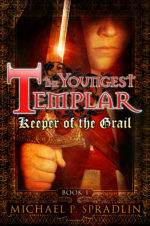 Run out and grab a copy of both Keeper of the Grail and Trail of Fate for all of the young readers on your holiday list. 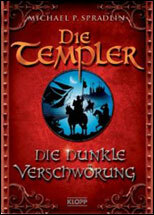 This series is sure to launch even reluctant readers into adventures that they’ll be fantasizing about for a long time! But be prepare to buy the third book when it comes out next year. 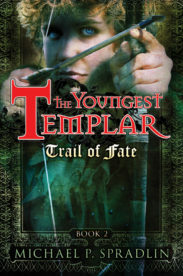 I highly recommend The Youngest Templar: Trail of Fate to people who like action, adventure and historical fiction. Totally full of action and adventure, this was a real page turner that I am not going to forget. It sweeps you in from the very first page and you won’t want to put it down until you finish it. Trail of Fate is another intriguing novel that should appeal to advancing readers who like a lot of adventure. The ties to historical facts will help educate some readers to that era making it useful for school too. SPOILER ALERT: This book is a sequel and should be read after Keeper of the Grail. The following excerpt contains spoilers. A wall of ocean pushed me beneath the surface. I fought my way up into the air as the water rose and twisted violently and tried to remember where I was. The tossing of the ship had swept me into the sea. I had no idea how long I’d been in the water but recalled seeing the broken mast come hurtling toward me but could remember nothing else. Over the sound of the wind I thought I heard Robard screaming, but it sounded faint and far away. Also, I tasted blood in my mouth. The moon was completely obscured by the storm clouds. It was so dark I couldn’t see anything. As I came to my senses I was completely disoriented by the sensation of the angry sea rising and falling. I could not tell up from down. I only knew I was wet. And frankly, a little tired of it all. Bursting through the water’s surface, I sucked in fresh air and felt for the satchel around my neck and shoulder, relieved to find it still there. The rushing sound of water behind me rose again and I hollered out a curse. But the water was on me now and I dipped violently in the trough before the wave threw me into the air. I hit the water on my back with a smack and the breath was pushed from my lungs. Another wave carried me up and then dashed me down again, and I collided with something hard. At first I thought it was a rock, but when the wave subsided, my feet touched the sea bottom. More waves crashed into me but when they returned to the sea, I could stand. I didn’t know which way to turn in the darkness with the howling wind and rain pelting my face. But then as if God wanted to give me a fighting chance, (or else keep me alive a bit longer to further torment me later) a flash of lightening flickered across the sky and in a brief instance I saw land ahead of me: a shoreline, with trees and rocks in the distance. Shouting in glee, I scrambled in the direction the lightning had shown me, the water growing shallower with each step and before long it reached only my waist, then knees. With every last ounce of strength I splashed forward until the sand was under me and I collapsed to the ground. I woke to the taste of sand. It was salty and gritty and light was coming from somewhere. Where were Robard and Maryam and the dog? Why couldn’t I see them? But then I couldn’t really see well at all, as my eyes were full of sand. I blinked to clear them and only partially succeeded. It was relaxing to lie so peacefully but I made the mistake of trying to lift my head and the world spun away from me. I sank into unconsciousness. When I came to again I was no longer moving, but was still very wet. Opening my right eye I wiggled my fingers, delighted to see they worked. I’m not sure how much more time passed before I tried to move additional body parts. I clenched a fist. No pain..
Sore everywhere, I drove my fist into the sand, lifting myself up on one arm. It was daytime now, and the sun was high in the sky so it must have been nearly noon. There was a line of trees about two hundred yards further inland. Pushing myself up to my hands and knees I winced when pain shot through my left knee. I had a vague recollection of hitting it on something last night while thrashing about in the waves. My right elbow also throbbed, but didn’t feel broken. When the dizziness passed, I finally stood. My back wouldn’t straighten all the way and I wondered if my ribs were broken. I looked at the now calm sea. There was no indication of the fury it had unleashed on me last night. Looking up and down the beach, I could only see a league or so in each direction before the shoreline bent out of sight. “Robard! Maryam!” I shouted, but no one answered. Only the squawk of a few shorebirds disturbed the quiet. “Little Dog!” Nothing. No answering bark. With every intention of walking along the beach, I stumbled to the ground after a few steps, too tired to go any further. Dropping on the sand, I quickly fell asleep. When I woke there were six people standing around me. Two of them were young women, four were men. Each held a horse by the reins. All of them were pointing swords at me.